Call-and-response shows up in all sorts of music, from the blues, to chain gangs, to different parts of the Catholic mass, to English sea shanties. It’s a pretty simple concept. One person plays or sings a musical phrase and another repeats it. This famous scene from Deliverance illustrates the idea. Aside from an example of call-and-response, it’s a beautiful example of how different cultures connect through music. You can use it in a song – singer sings a melody, guitar player repeats it; the drummer plays a rhythmic phrase, guitar repeats it. It’s difficult to be subtle about this. Use it sparingly. Example: player 1 plays the first 4 notes of a melody, player 2 plays the next 4 notes, player 3 plays the next 4 notes, etc. Each player plays their notes alone. The effect is that the entire phrase jumps around from place to place in the performance space. The challenge is to make it sound smooth. Here’s an example of a rhythmic idea. Here’s that same idea passed around between three players. The interlocking technique can be a beautiful thing. Do this with two to four players. More if you can make it work. Each player plays something different, and everything that’s played “interlocks” into something that works as a single thing. 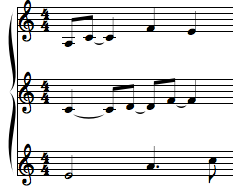 Notice how notes are played together in only two places: the first beat and the third beat. This can work with chord progressions, too. Substitute the notes in the example for chords, and have the guitar player play the top rhythm while the piano player play the middle rhythm. Try it with just one chord. The bass player plays the bottom staff rhythm. Make up some other interlocking rhythms. You can make it simple or complex.